This is a binocular head for stereo microscope. 20X and 40X two super widefield magnification settings. 48mm (in diameter) female thread for adding Barlow lenses or lights. Mounting Size: 64mm in diameter. This is a super widefield binocular stereo microscope head with 20X and 40X magnification settings. It includes a pair of super widefield high-eyepoint WH10X eyepieces coming with 45° inclined 30mm eyetubes with diopter. The microscope provides high resolution clear images, super widefield of view and large working distance. It fits all the focusing racks with a 64mm in diameter O-ring holder. 20X and 40X Magnification Settings. 45° Inclined Binocular Head with 30mm Super Widefield WH10X Eyepieces. Sharp Stereo Erect Images over a Wide Field View. High Quality Clear Original True Color Images. Accurate Alignment Ensuring a Fatigue-Free Viewing. Head: 45° inclined 360° swiveling binocular. Eyepiece: WH10X super widefield 30mm. Interpupillary Distance: 1-7/8" - 2-15/16"(47-75mm). Head Mounting Size: 64mm in diameter. Accessory Mounting Size: 48mm female thread in diameter. 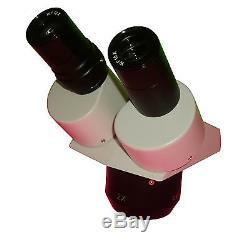 The item "20x-40x Super Widefield Stereo Binocular Microscope Head" is in sale since Wednesday, April 17, 2013. This item is in the category "Business & Industrial\Healthcare, Lab & Life Science\Lab Equipment\Microscope Parts & Accessories". The seller is "microscope-mart" and is located in Durham, North Carolina.